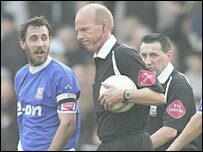 Damien Francis broke Ipswich Town's defiance with a late winner in this FA Cup fifth-round tie at Vicarage Road. 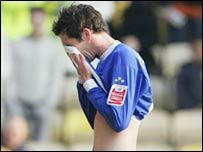 Francis stole in to steer home Tommy Smith's cross to crush Ipswich, who played 45 minutes with 10 men after George O'Callaghan's harsh red card. Ipswich were twice denied by the woodwork, with Sylvain Legwinski hitting the bar in the first half. Danny Haynes also netted after Dan Harding rattled the underside of the bar, but was denied by an offside flag. In keeping with a scrappy, bitty opening the first chance fell to Watford from Chris Powell's long throw. The ball was flicked on by Danny Shittu but Smith's second touch only took it off the toes of Steve Kabba who missed his kick allowing Lewis Price to gather. Ipswich were coping comfortably with Watford's direct style, and played what little football was on view on a firm, bobbly pitch in a stiff breeze. The Championship side almost took the lead on 15 minutes when Legwinski's swirling shot from 25 yards fooled Richard Lee who was relieved to see the ball cannon back off the bar. Ipswich grew in confidence and Harding surged down the left flank before slipping a pass to Haynes who stepped inside a couple of challenges to drill a shot into the side netting with Lee groping. In among the swirling maelstrom of misdirected energy, veteran Watford defender Powell was the acme of cool. The 37-year-old used his experience to shackle Edgar Davids lookalike Jaime Peters, and doing things at his pace allowed him to use the ball astutely. But on the stroke of half-time, referee Steve Bennett provided the big talking point by ending O'Callaghan's full debut with a red card. O'Callaghan and Shittu landed in a tangle of limbs after competing for a high ball, but referee Bennett felt the Ipswich player's flailing leg which caught Shittu on the back was deliberate. The reduction in their numbers did not inhibit Ipswich, and Haynes showed skill to flip up a ball played into him and thump in a volley which drew a smart save from Lee. Watford had created nothing from open play in the first half but almost scored twice from set plays. From a Yohann Cavalli free-kick Jay De Merit skewed an unmarked header across goal, and from the resulting corner Darius Henderson powered in a header which Matt Richards headed off the line. As the game sparked into life Ipswich were twice denied the opening goal, first when Harding's shot struck the underside of the bar, and then by an offside flag to deny Haynes as he headed the loose ball in. Smith then squirrelled his way to the dead-ball line where he stood up a cross at the far post which Henderson headed over. Just as Ipswich were heading for a deserved replay, Watford struck to break their hearts. Kabba's flick released Smith who made ground before squaring back a cross which Henderson dummied to leave Francis clear to side-foot home from eight yards. "It was a good game but we did not do that well for the first 85 minutes and they were better than us. "We think we can get play better. It is great to be in the last eight of the FA Cup but it will be better when we know who we have got in the next round. "The players who came in have done really well for us and they defended particularly well and that was vital." "In football, as in life, you don't always get what you deserve. "I've seen Danny Haynes goal that was disallowed and the linesman was dozing. It was a goal. "George O'Callaghan's sending off was harsh, it was a tangling of two players coming together, but I'm proud of my players." Watford: Lee, Mariappa, DeMerit, Shittu, Powell, Smith, Francis, Mahon, Cavalli (Bouazza 66), Henderson, Kabba (Priskin 89). Subs Not Used: Loach, Doyley, Bangura. Ipswich: Price, Wright, Bruce, Casement, Harding, O'Callaghan, Richards, Legwinski, Roberts, Peters (Trotter 80), Haynes (Clarke 72). Subs Not Used: Supple, Currie, Sito.